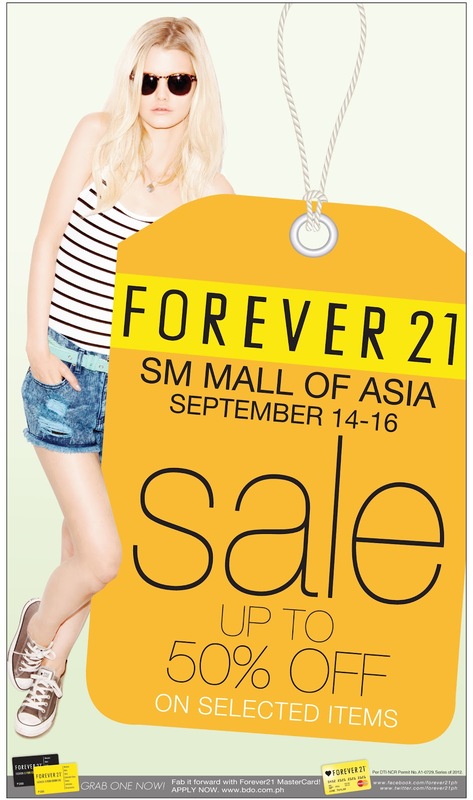 Forever 21 SM MOA 3-Day Sale Weekend!!! Get those wallets ready, or don't go to MOA this weekend. Temptation galore!!! Forever 21 SM MOA is on sale from Sept. 14-16. 1.) 10% off on all regular-priced items using your SMAC/ BDO Rewards/ Prestige card until 12nn on Sept 14. 2.) 10% + 10% off on all regular-priced items using your Forever 21 MasterCard + present your SMAC/BDO Rewards/ Prestige card until 12nn on Sept 14, minimum net single receipt purchase of P5000 required. 3.) 10% off on all regular-priced items using your Forever 21 MasterCard from Sept 14-16, minimum net single receipt purchase of P5000 required. Hi Ms. Aisa..It's me again :) I just started my blog..hope you can check it out and maybe teach me some tips too..